OXFORD, Miss. 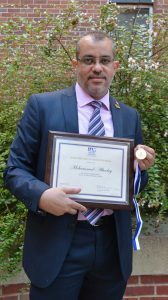 – Mohamed A. Albadry, a recent Ph.D. graduate from the Department of BioMolecular Sciences in the University of Mississippi School of Pharmacy, has won the 2018 Harvey W. Wiley Scholarship from AOAC International. AOAC International develops global quality standards for microbiological and chemical materials, ranging from food to pharmaceuticals, in an effort to ensure public health. Each year, the winner of AOAC’s Harvey W. Wiley Award chooses the corresponding scholarship recipient from an institution of their choice. The winner of the 2018 award was Ikhlas Khan, director of the UM National Center for Natural Products Research. Khan, who was Albadry’s graduate adviser, chose Albadry for the scholarship based on his work on synthesizing powerful but rare natural products that could provide the basis for new and helpful drugs. Albadry received $1,000 and travel funds to the Aug. 26-29 AOAC meeting in Toronto. Albadry, a native of Egypt, said he was “honored and happy” to receive the scholarship, and that he hoped it would help him advance his career goals of working in academia and in the dietary supplement sector of natural products research.